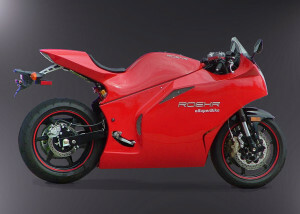 Meet the eSuperBike by American Superbike-building company Roehr Motorcycles. The eSuperBike (what's in a name...?) is claimed to be the world's fastest commercially available electric motorcycle. This electric monster is driven by 2 electric motors supplying it with a combined output of 96 hp. With the eSuperBike only weighing in at just over 225 kg, they're able to get this bike running at a max speed of about 215 km/h! The batteries - with a combined capacity of 7,7 kWh - will provide you with a range of about 160 km. And all this for merely 27.595 USD! If that's a little over budget, you can get the more low budget eSuperSport (just under 17k USD), which has just one of the motors (and consequently half of the horsepower). As it weight just under 180 kg it will take you about 130 km from home before you're charging, at a respectable 160 km/h. Doesn't sound like a bad deal to me. The model, you either love it or don't. I don't. But I'm glad to be able to write about an eBike which isn't an idealistic and futuristic concept 3d-render for a change ;). Forget hybrids, on to the electric future!